Broker’s comments: MYSTIC was the yard’s first yacht of a successful series that was introduced due to the stronger demand for motor yachts over 40m pushing for longer delivery times. CMB took advantage of the in-house expertise and workmanship combined with world-class European equipment and suppliers to deliver a unique yacht on time and within budget. Her high-spec engineering and sleek, sophisticated exterior lines are the work of the renowned Holland based Diana Yacht Design company. Set over three decks, her generous outdoor spaces play host to a wide range of amenities and ample space for sunbathing and relaxation. The impressive sun deck features a large Jacuzzi, covered outdoor bar with seating and five fixed reclining sun loungers, perfect for socializing, entertaining and taking in the spectacular views. The spacious, covered al fresco dining area offers stylish furnishings and ample seating for any time of day whilst on the lower aft deck a large garage houses a large tender and a variety of water toys and diving equipment to keep even the most restless travelers entertained. Beautifully styled by Schnaase Interior Design, her lavish accommodation features a unique layout that sleeps up to 10 guests in five sumptuous staterooms, with additional room for eight crew on board. The superb owner’s suite is situated on the upper deck with a private aft deck, full beam dressing room, opulent en-suite bathroom and private study room, offering the ultimate in luxury and privacy. Her main deck is dedicated to comfort, leisure and entertainment, comprising a fully equipped gym, sauna, spa and private cinema whilst her decadent living areas play host to sumptuous seating and an elegant formal dining room. A modern Art Nouveau style blends with an elegant oriental flair to create a lavish yet comfortable feel. Deep Mahogany, Oak and Walnut woods are complimented throughout by light-reflecting white and silver lacquer work, a beautiful selection of silk and woolen fabrics, tiled bathrooms with marble and onyx floors and jewel encrusted light fittings. The large windows allow for plenty of natural light to enhance the feeling of space on board. Twin MTU engines give Mystic a top speed of 17 knots with an estimated cruising range of 4000 nautical miles. Built to RINA Charter Class for Unrestricted Navigation and MCA LY2 Regulations, she also features zero speed stabilizers for outstanding on-board comfort as well as bow and stern thrusters for exceptional maneuverability. She offers the perfect platform for all manner of cruising vacations, from chartering to an experienced owner wishing to explore the world with his family. Accommodation The yacht has a unique layout of accommodation to maximize entertainment and ensure Owner's privacy featuring one Master Suite situated on the Upper Deck with its own aft private terrace and dining. The Master Suite has en-suite bathroom with shower and walk though full beam dressing room and owner's office. There are also two double guest cabins with en-suite bathrooms on the lower deck whereas her main deck is dedicated to comfort, leisure and entertainment, comprising a fully equipped gym, sauna, spa and private cinema. Her decadent living areas play host to sumptuous seating and an elegant formal dining room. The versatility in the design makes it possible to retrofit the main deck quite easily if a future owner prefers his Master Suite down below on the main deck instead. Mechanical, propulsion and engine room equipment ENGINES:2 x MTU 12V 2000 M72 - 1,450HP ENGINE HOURS: 1500 hrs GEARBOXES: 2 x ZF 3050A A–drives STEERING: 2 x Data 1000-PS 380V electro- hydraulic systems 2 x BT Marine STABILIZERS:Arcturus Marine, TRAC Model 540 zero speed stabilizers GENERATORS: 2 x Northern Lights 105 kW - 4200 hours logged 1 x Harbar 55 kW - 6500 hours logged AIR CONDITIONING : Marine Air Scroll R-407C MCW150 380/50/3, 450.000BTU Marine Air Fresh Air System OTHER EQUIPMENT: 2 x HRO Coral Sea watermakers producing 450 litres per hour 1 x 20” 80kW American bow thruster 1x 20” 80kW American stern thruster 1 x Mahle NFF filter for main engine 1 x Algae-X filter for generators 1 x CM 652BT G&R fuel pump 1 x G&R Diesel Emergency Pump 5 X G&R Maxi Sub 180W submersible bilge pumps 2 x G&R ACM 652 BT centrifugal bilge pumps 2 x stainless steel boilers, producing 550 litres per hour HAMANN sewage treatment system EVAC freshwater vacuum system BATTERIES: 6 x MVG12/200 AH 12 x 1000Ah MVSV1000, 2V 4 x AGM 12/225, 225 AH 3 x AGM 12/160, 160 AH Galley, domestic and laundry equipment 2 Miele Professional washing machines, 2 Miele Professional dryers Entertainment equipment Kaleidascape and Crestron System throughout with iPod dock in all guest areas Saloon and Dining:Sony Bravia 52” LCD Screen Rotel RSX-1057 Sur/Pro Receiver RS232 THX Cinema: Projection Sony Master: Sony Bravia 46” LCD Screen Harman Kardon AVR 147 6+1 6x40WAVR with ipod B&W CWM 800 Ceiling B&W CWM 616 Ceiling B&W ASW 150W Active Sub AMX 5" wireless touch panel Harman Kardon DVD27 HDMI DVD player Guest Cabins: 6x40WAVR with ipod connectivity B&W AS2 150W Active Sub Sony Bravia 32” LCD Screen Denon AVR 147 6+1 Crew Cabins: Denon AVR 147 6+16x40WAVR with ipod connectivity Deck equipment ANCHOR WINDLASS: 2 x DATA 3300 H KR-20l Q 20.5mm hydraulic windlasses CHAIN: 2 x 110meter 20 mm diameter AFT WARPING CAPSTANS: 2 x DATA 3000 H Kr hydraulic capstans BOAT CRANE & DAVITS: Electro-hydraulic with its own power pack GROUND TACKLE: Anchors 2 x 310kg Fortress high holing PASSERELLE: Electro-hydraulic with its own power pack Safety and security equipment 4 x Viking 20 Person Lift Raft - SOLAS A 1 x G&R ACM-652 BT 400V sea water pumpproviding 600 litres per minute 2 x Emergency Position Indication Radio Beacon 1 x G&R Diesel Fire Pump 25 x solid core life vests 4 x hoses provided with a jet and spray nozzle 4 x Viking life rings FM 200 or CO2 extinguishers in engine room Tenders and toys 4.2m Joker with 50Hp outboard 4.6m Valiant with 25Hp outboard Sea-Doo 150 Speedster, 215 HP Sea-Doo RPX 215 JetSki Custom-built in 2010, Mystic is one of the finest displacement yachts of her size available on the market and offers exceptional value for money. Winner of the 2011 International Yacht Design Awards (Power Yacht over 40m), she has been crafted with meticulous attention to detail by award-winner designers. Her lavish accommodation sleeps up to 10 guests in five beautiful staterooms, featuring a spectacular fully private owner’s deck with full beam dressing room, en-suite bathroom and private study room. Set over three decks, her generous outdoor areas play host to a wide range of amenities including a Jacuzzi, bar and ample space for relaxing, sun-lounging and al fresco dining. Having only been used privately by one owner since new, she is presented in immaculate condition and offers the perfect platform for exploring the world with family and friends. 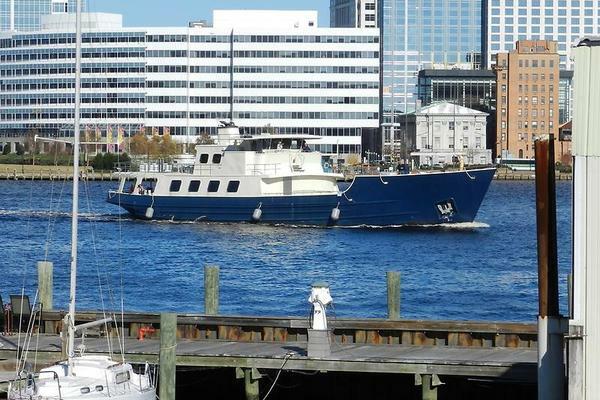 United Yacht Sales New Jersey would love to guide you through a personal showing of this 150' Cmb Yachts Custom 2010. This yacht for sale is located in Corfu Greece and priced at $9,950,000. For a showing please contact us by filling out the form on this page and we will get back to you shortly!